Amaze and astound your friends and neighbors by learning 20 different tricks! Teaching and practicing tricks is a great way to build your bond with your dog! 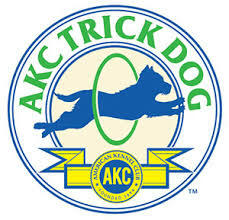 On week 6, the Novice trick dog test (performing 10 tricks of your choice) will be administered, allowing you to earn the "AKC Trick Dog" title. This class is also great for people who plan to do therapy dog work with their dog. Tricks are an easy way to entertain! If you have already passed the Canine Good Citizen Test, you are only required to demonstrate 5 new tricks to earn the title!